Rachel Tucker and cast in London's "Come From Away"
Rachel Tucker is known both sides of the Atlantic as an especially thrilling Elphaba in Wicked and as a singer who has enlivened various concert halls and cabaret rooms, performing both solo and alongside Jason Robert Brown and Kristin Chenoweth, among many others. 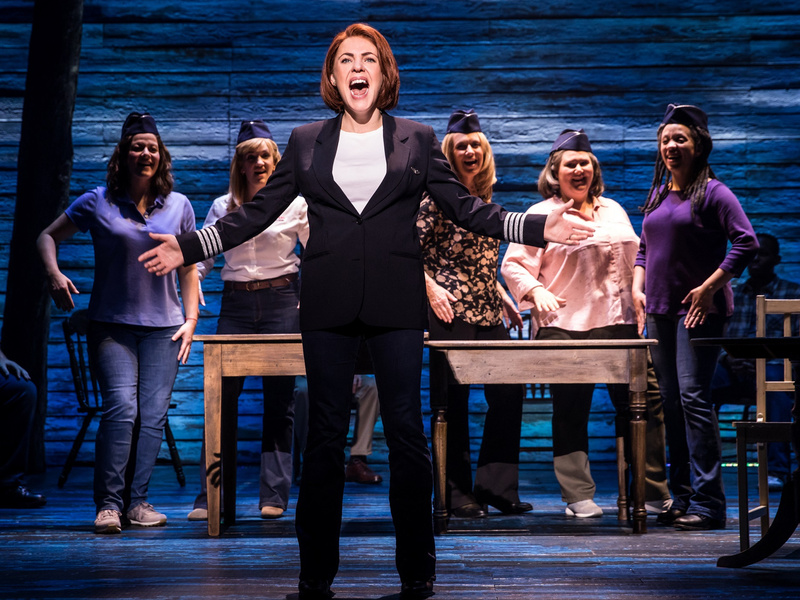 But the Belfast-born vocal powerhouse is reveling just now in her first show she has originated in the West End: the U.K. bow of the Broadway hit Come From Away at the Phoenix Theatre, for which Tucker has also been nominated for her first-ever Olivier Award. As a result, the mood was upbeat and then some when Broadway.com phoned for a chat. I know, I can’t believe it! I’m so excited and honored. Honestly, I can’t believe they have recognized me and my work because that’s what it is. It’s about the industry going, “We appreciate what you do,” which is the sort of thing we all dream about; it’s very special. Were you watching the nominations unfold in real time that Tuesday lunchtime? Did it feel especially sweet, in a way, to have the Olivier nod sneak up on you? It was nice because I wasn’t thinking about it or waiting on it. It was a very nice sneaker-upper! What do you make of your competition, which includes Tony winners Patti LuPone (Company) and Ruthie Ann Miles (The King and I) and the all-female cast of the sleeper musical hit, Six? And then there’s little old me! Honestly, I feel as if I have won just by being with those women. I saw The King and I with Ruthie and am so in awe of her and what she has had to go through: she deserves the award on that alone. And if Patti doesn’t have 12 Oliviers by now, I don’t know what—I mean, she is an Olivier [laughs]. And then you’ve got these young girls [in Six] shouting about what new musical theater is going to be. I am more than happy just to be in the category. 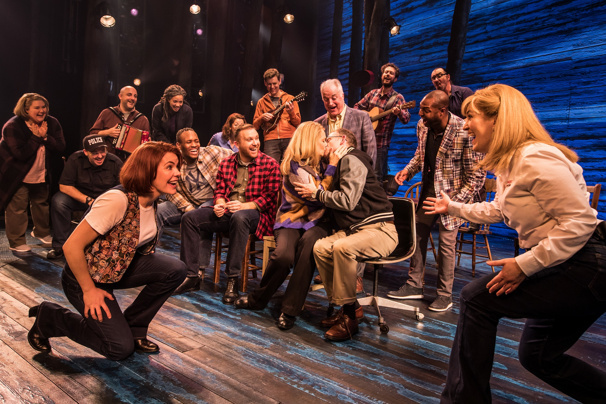 After your multiple take-overs in Wicked, did it feel nice to be in at the beginning with Come From Away, at least for London? This is the first time I have created a show on the West End! My agent reminded me when I got nominated that apparently four years ago I had sat down and said that I wanted to be in a position where I am eligible for and nominated for awards. I want to originate roles because that’s where I feel my career needs to go: I felt as if it was the next step and then unexpectedly it happened! So in some ways isn’t this the perfect contrast to your long history with Wicked? The last show I did in London was five months in Wicked during the 10th-anniversary year and that felt like a great send-off so that I could hang up my hat and my broom for the last time. But having originated [Sting musical] The Last Ship on Broadway [in 2014], I felt as if the Americans had seen more of what I am capable of, even though I’ve spent more time in England. This is the first time on the West End that people have been able to see me in a show from the ground up. Are you saying you’re done with Wicked? Unless it’s the movie, really, in which case now, we’re talking! [Laughs.] But, listen, whoever that goes to will have an amazing opportunity; in the meantime, I feel for myself as if I have got to the age where I’ve done it. I had reached the point where I could cope with the show even through tiredness; it had become an easy enough gig for me to do. Yes, in that I would choose Wicked if you were to say to me, “If you had to do one show again that you love and are comfortable with and you have done before, which would it be?” But I don’t want my career just to be easy to sail through. I don’t want to sit in a job for the sake of financial comfort; I want to challenge myself. Had you seen Come From Away prior to taking on Jenn Colella’s part of airline pilot Beverley Bass first in Dublin and then in London? I got to see it in New York in September when I already had the job. I was very excited and brought my husband and we had never seen anything like it. I was ugly-crying, I have to say—laughing and crying at the same time with snot coming out of my nose. It really just struck me in the plexus; I was an absolute mess. Have you got to know the real Beverley Bass? I met her first in Dublin, and she and Tom [Stawicki] are the most gorgeous couple. It’s been so inspiring to hear her stories and all the stuff that isn’t in the show and the details you wouldn’t have got just from the creative team. Sometimes when there’s the line about “the first female American air captain in history,” women in the audience will scream and cheer. It feels like such a massive thing to say—and then for her to go on to have a family and still fly and to have this plane with 300 passengers who are stranded in Canada and all the while to be worried about her own family. How are you feeling about your forthcoming stint on March 31 as one of Jason Robert Brown’s special guests (Heathers star Carrie Hope Fletcher is another) at the Theatre Royal, Haymarket? Jason saw me in The Last Ship on Broadway and was quite taken with me, I believe, and asked me to do his gig in New York. Since then he’s kind of kept calling on me, which I’m very happy about. I just emailed him this morning to find out more about what we are doing but haven’t yet heard back. He likes new stuff, but I don’t know between now and then how much new stuff is going to go into my brain! And with the Oliviers the Sunday after that [April 7], are you besieged at the moment with offers to dress and style you? Have you thought about wearing whatever Clive and Rob wear? I need to get something or I’ll turn up in a tuxedo, and let’s see how that goes down!